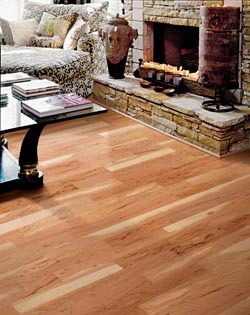 Upgrade the look and feel of any room in your home with our expansive selection of laminate flooring. When your floors begin to fade and wear from heavy traffic, replace them with affordable flooring that stands the test of time. Upgrade the value of your entire home when you replace your existing floors with new laminate flooring. Choose from an extensive array of colors and patterns that are sure to fit any design theme you have in mind. When your friends and neighbors see the difference that our value-added laminate wood flooring makes in your home, they are sure to become loyal customers of ours as well. New laminate tile flooring in your business is the perfect way to entice new customers and improve your employees’ morale. Fill your favorite places with the warmth and character of traditional hardwoods without worrying about the effects of heavy traffic and moisture. When you choose from our selection of laminate wood flooring, you get an innovative surface that is crafted from pressed woods and advanced materials that withstand high levels of moisture and wear. These floors are the perfect way to renovate your favorite rooms with stylish, budget-friendly surfaces. Our design specialists are here to help you find the right texture and grain for the interior décor you own. In fact we guide you every step of the way—from selection to laminate flooring installation. Enjoy the exceptional look of laminate wood floors and expand your design horizon with the money you save. Modernize the appearance of your kitchen and bathrooms with our affordable and easy to maintain laminate tile flooring. Let your creativity loose and choose from our extensive selection of colors and patterns that help you restore any room or area. You are sure to find floors that best suit your needs in looks, performance, and price. With the ease of maintenance that comes from laminates, there is little concern about their lasting appearance and durability. These resilient floors are the perfect choice for households with kids and pets, and they look great as well. You don’t have to sacrifice the style you have always wanted in favor of the durability your family requires. New laminate floors offer you a cost-effective alternative with many benefits. You can upgrade any area or room at home with an affordable laminate floor. With advanced manufacturing techniques, these floors can simulate the look of many different materials, including natural stone, hardwood, and porcelain. They are highly versatile, easy to install, and resist molds and bacteria. In addition, laminate floors resist moisture and are available in many attractive colors and patterns. Protect your investment with the proper installation. Get the best fit possible for the unique spaces in your home or business when you rely on our professional laminate flooring installation process. Our skilled and experienced installers have the knowledge to ensure your new floors look great and last long. We are so confident about our products and services that we offer one of the best warranties in the industry—the Ultimate Confidence Guarantee, which states that if you are not satisfied with your four or five-star rated floor within 30 days of installation, we will replace it at no cost to you. With our competitive pricing and professional experience, the choice for your new interior is clear. Save time and money on your next home improvement project by working with our laminate flooring installation team. Contact us today for a free estimate on the total cost of brand new laminate flooring for your home. We proudly serve customers in East Tawas, Michigan, and surrounding communities.